A few weeks ago, I posted an activity that I had started where the player had to find items in the giant’s house. Clicking on the item gives a short story about it . You can do a math problem to “buy” a hint, which is something you will need once we hide the items really well. Any other suggestions we get from teachers, students or others who play our games. 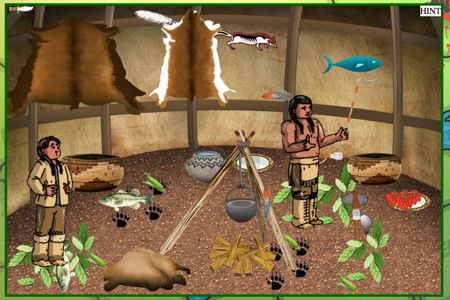 Several people liked option 2, so I added a function where for most of the items, you get a short fact related to the item you clicked in Native American culture, particularly the Ojibwe people. I added two movies (option 3). I haven’t finished option 4 yet , using a math problem to buy a hint, although that was also a popular one, so it is in progress. A couple of people emailed me and said that the items were just scattered around (true) and it would be better if some were hidden behind others. That was done, also. There was also something that bugged me, which was that unless your internet was really fast, the items didn’t all load at the same time, so you saw, for example, the items you needed to find and then the background. If you want to know the coding behind how this was done, check back tomorrow for a new series CODING TUESDAY. So, here you go .. I am still working on this and more comments are always welcome. Cool! I checked all the links and they loaded up quick on my Windows 8.1 tower after initial download of ten seconds. I didn’t see the items to find on the progress link page load. Good work! I liked how the hints so far kept up with what was left to find. Both videos loaded played immediately upon click. I found the fur video had a calming hunker down feel. I think you did good with that video using authentic tribal photos with the winter scenes. The other video with coup stick I jumped on my chair! I was like I am awake now! I loved hearing what sounded like authentic Dakota drum music! I was thinking the music would make a student wake up and grab their attention. I liked how a native speaker explained the counting of the coup. The only thing I noticed on progress link was on the You Found Everything! page. I saw where the native’s left hand was nipped a little in the fingers due to word window. I know that is easily corrected by just moving the image a little. I thought the artist did well on the natives. I like the comic book feel. I am looking forward to seeing where you go on the math hints! I have no idea what the teachers need on feedback. Glad you liked it. That coup stick video got me the first time, too!